For background, see "U.S. Government Unlawfully Detaining and Deporting U.S. Citizens," Virginia J. of Social Policy and the Law (2011), 115 pp. The Deportation Research Clinic has assisted many U.S. citizens unlawfully detained or deported by the U.S. government and worked to bring their cases to the attention of the public. Analysis of U.S. citizens in immigration court, and applying for Certificates of Citizenship, January 1, 2011 through June 9, 2017. Posted July 31, 2017. ﻿Citizenship in Question: Evidentiary Birthright and Statelessness (Duke University Press, 2017), co-edited with Benjamin Lawrance. Clinic FOIA attorney Andrew Free represents Robles; case first reported by Clinic Director Jacqueline Stevens. Clinic research assistants Ary Hansen and Elizabeth Meehan analyze immigration judge misconduct data. Agency supervisors ignore serious complaints if not from government. Responses take hundreds of days, and recommend "oral counseling" or no response. Professor Heather Schoenfeld, School for Education and Social Policy and Legal Studies to co-author research article with J. Stevens. "Citizenship In Question: Forensic Challenges of Birth, Blood, and Bureaucracy," co-edited with Benjamin Lawrance, based on conference convened by co-editors at Boston College Law School and co-sponsored and organized with Dan Kanstroom, Rachel Rosenbloom, and Rogers Smith. Contributors narrate failures of signification for passports, certificates, and databases from Australia to Togo. Introduction draws on Jacques Derrida to suggest failures of a-scription and to reveal narrative strategies that empower arbitrary authorities at the expense of the people populating the identities government creates. July 2015. Stevens encounters U.S. citizen Lorenzo Palma detained in Houston for over a year, finds documents, and works with Andrew Free to obtain termination order in February 2016. Clinic assistant Hayley Hopkins transcribed oral order for Palma to submit for U.S. passport. For more information, see the States Without Nations blog. Roberto Dominquez was born in Lawrence, Massachussetts and thus a U.S. citizen at birth. Nonetheless, he was banished for ten years to the Dominican Republic. Copious additional documents tie plaintiff Roberto to the Roberto Dominguez on record as born on his birthday in the Lawrence Hospital. The U.S. government attorney will not return phone inquiries; the government answer conjures a world with two Roberto Dominguezes, both born in November 1979, both with parents at the same address, but one born in Lawrence, while the Plaintiff was born in Santo Domingo, and magically acquired the documents for the Roberto Dominguez born in the USA. For more background on this case, please go here. Eventually U.S. Citizenship and Immigration Services (USCIS) saw fit to issue him a Certificate of Citizenship, but there was a problem. Since the government had deported him, the government could not provide him with the certificate. Andres eventually made his way back in, thanks to the persistence of immigration attorney Larry Fabacher, who had to badger the U.S. government for months after the USCIS confirmed Andres's U.S. citizenship. 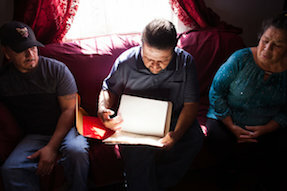 Just days after Andres returned to the United States with a U.S. passport card in August 2011, ICE issued ANOTHER immigration detainer against him, causing several more days of illegal detention. Following several unsuccessful efforts by his older sister, Maria, to obtain legal counsel seek remediation, civil rights attorney Andrew Free, who represents the Deportation Research Clinic in our FOIA litigation, stepped in at the request of the Clinic and filed suit. For more information on this case, please see here. In 2008, a jury found Esteban Tiznado Not Guilty of Illegal Reentry because of documents and testimony affirming his U.S. citizenship. Immediately after, ICE ignored the verdict and deported him. The Clinic obtained records under the Freedom of Information Act (FOIA) and revealed that Citizenship and Immigration Services in the 1980s hid evidence that would affirm his U.S. citizenship. United States citizen Mark Lyttle, deported to Mexico, collects $175,000 from settlement of lawsuit brought against the federal government. Clinic Director Jacqueline Stevens obtained Lyttle's file under the Freedom of Information Act (FOIA) and brought his case to the ACLU. UPDATE: Ocampo settles lawsuit, May, 2016.